In its third year at Hampden Park, the home of Scottish football, Glasgow’s Whisky Festival showcased hundreds of whiskies to thousands of attendees. The event’s success says much about the changing fortunes of Scotch whisky – and Scottish football – as Neil Wilson discovers. Once upon a time there were no whisky festivals. To millennials this might seem inconceivable, but it is a fact. On Saturday, 11 November at midday I entered Session 1 of Glasgow’s Whisky Festival (GWF) at Hampden Park, the home of Scottish football, barely recalling the last time I was there for the 1976 Scotland v England game, when Kenny Dalglish nutmegged England goalkeeper Ray Clemence for a famous 2-1 home victory. The banning of alcohol at football games in Scotland was four years away at the time and, while 2,000 whisky enthusiasts would be enjoying a huge range of drams inside Hampden’s immaculate Lomond and Nevis Suites, the few hundred fans at the Queen’s Park v Arbroath game that afternoon in the stadium proper would still be unable to buy alcohol in any shape or form. The GWF has been going for eight years now and is run by Julie Hamilton, a founder member of Glasgow’s Whisky Club, Paul McDonagh of the Bon Accord Whisky Bar and Ale House and Mark Connelly (late of the Good Spirits Company of Bath Street and founder of WhiskyWhiskyWhisky.com). Together they managed to get over 60 exhibitors together, who listed almost 250 whiskies, as well as about 25 gins, vodkas, rums and liqueurs (there were also some ‘under the table’ drams to sample if you were lucky). The festival mission statement is about independent bottlers and distillers who are based in Glasgow or associated with it. That brings in Glengoyne and Auchentoshan as distilleries, and it was good to see Liam Hughes of Glasgow distillery and Alastair McDonald of Clydeside distillery moving through the press as well. The Arches beneath Glasgow Central Station was the home of the current festival until it was beset by legal problems – and this is where Hampden came in. 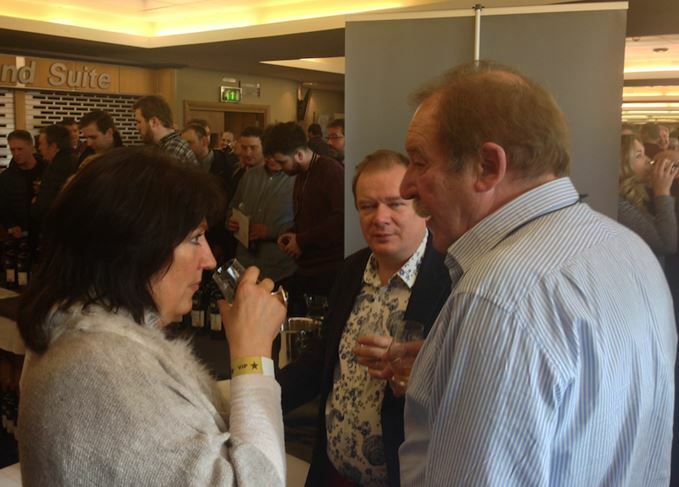 Now in its third year at the stadium, it is the largest whisky festival I have attended. The presence of so many people all chasing a similar objective tends to turn me away from these events (I avoid Islay during Fèis Ìle), but it is indisputable that they are here to stay. At the Scotch Malt Whisky Society stand I bump into Rachel MacNeill from Islay Whisky School, Charlie MacLean and Colin Hampden-White of Whisky Quarterly. This is an appropriate place to consider the fact that the SMWS was the start of the single-cask bottling movement that started in the early 1980s, when Pip Hills secured some stock of Glenfarclas for his Edinburgh crony syndicate. I survey the massed scene in front of me and wonder how many of the crowd can make this connection. Not many, I think, but am I missing the point? Do they care? I feel that, as a former shareholder and lapsed member of the society (number 589), I am perhaps being too Luddite in my conviction that it should have stuck to its core message, but having first been sold to Glenmorangie plc in 2004 and then again to private investors in 2015, the original ethos of it has gone. Despite that, a 17-year-old ex-Bourbon Arran finished in a red wine cask is lauded by MacLean – despite his ‘not being keen’ on wine finishes – and MacNeill makes sure I try a 23-year-old Longmorn from ‘under the counter’ – one of my favourite Speysides, which brings to mind the exceptional bottlings the society did of this whisky back in the 1980s. I drop in to see Andy Bell at Isle of Arran, who says the 18-year-old is ‘flying out’, while Clara Ross, global brand manager for Glenrothes, makes the point that her current project goes back to the SMWS’ original raison d’être: the release on the company’s e-boutique of cask number 8377, a 32-year-old outturn of 200 bottles priced at £375 and bottled at 49.6% abv on Hallowe’en 2017, of which only three bottles remain after barely two weeks on sale. Uniquely, the e-boutique ships worldwide to over 27 countries. The demographic in the suites is interesting. Large numbers of men with northern English accents, a split of maybe 90/10 men/women, and many overseas visitors. And the odd poor soul who can barely stand. I grab Paul McDonagh for some time out to enquire about this. As one of Scotland’s foremost publicans he is in the forefront of dealing with tourists and visitors to the city. He says: ‘Once only Edinburgh had no recognisable tourist seasons, now Glasgow is the same. People arrive from all over the world, at all times of the year, and plan a trip around this festival or another, then go onto a full tour of whisky bars, distilleries and so on. ‘And they spend. There are Americans, Swiss and Swedes here today and they will happily shell out £175 for a nip in the Bon Accord. I sold three Black Bowmore 1st Editions at £350 a go to some tourists recently. They did not blink and neither did my staff. He continues: ‘The days of “who’s going to pay that for a glass of whisky?” are gone. One 26-year-old bloke from China was in to kill time before a delayed flight, and he shelled out £1,800 including £900 for the tear-drop 75-year-old Mortlach from Gordon & MacPhail. And so 4pm loomed and it was time for Session 1 to close, before the next 1,000 souls descended at five o’clock. It had been a good afternoon, unless you were a Queen’s Park supporter. They lost 2-0. The whisky, called 1770, is the first of its kind produced in the city in over 100 years. A £6m investment will enable the Hillington site to double its whisky making capacity. Peated and triple-distilled whiskies will join the distillery’s unpeated 1770 single malt.